Don's Drive In opened in 1958 in Traverse City. 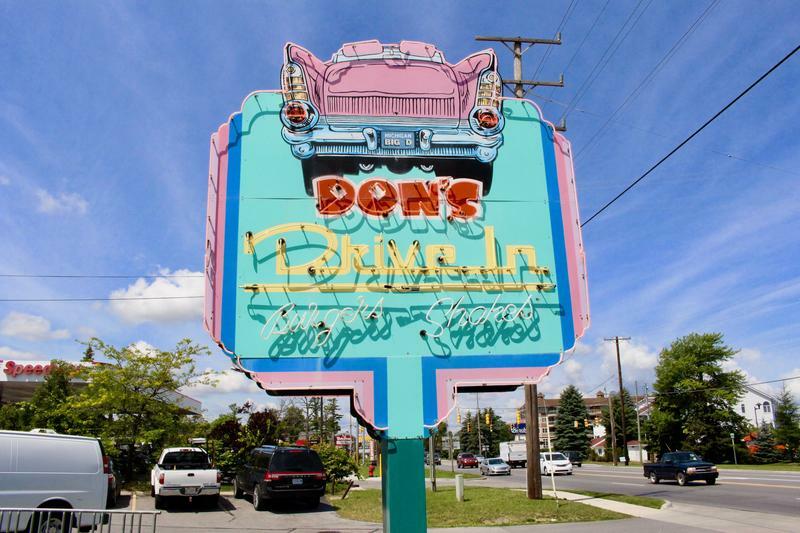 Staffers say going to Don's Drive In is like entering the 1950's or 60's. Today, Mary Korson orders a strawberry milkshake and BLT from the squawk box outside. It's considered old school because, for one, it has menus with squawk boxes lined up outside along a row of parking spots. Drivers, like Mary Korson in her pickup truck, park next to one of the boxes, check out the menu and push the button when they're ready to order. Then server Krystal Coyne responds over the squawk box, says "I'll be with you in a moment" and heads out to take the order in person. Customers park by a menu at Don's Drive In and hit the squawk box when they're ready to order. Krystal is entering her senior year at St. Francis. She's been working at Don’s Drive In for about a month. She takes Mary's order: a BLT on white bread and a medium strawberry milkshake "with the strawberries crushed up good." It's to-go. Her total comes to $12.12. High schooler Krystal Coyne carries an order out to an SUV at Don's Drive In. She's been working there for about a month. The inside of Don’s is about as old school as the outside. The drive-in opened in 1958, and General Manager Dan Reed says the interior hasn't changed much since then. It has a checkered black and white floor, red and white booths, a jukebox and an old pinball machine. He says the menu is also pretty much the same, except they’ve added things like fried pickles, curly fries and mozzarella sticks. Dan says burgers still make up roughly 90 percent of their sales. 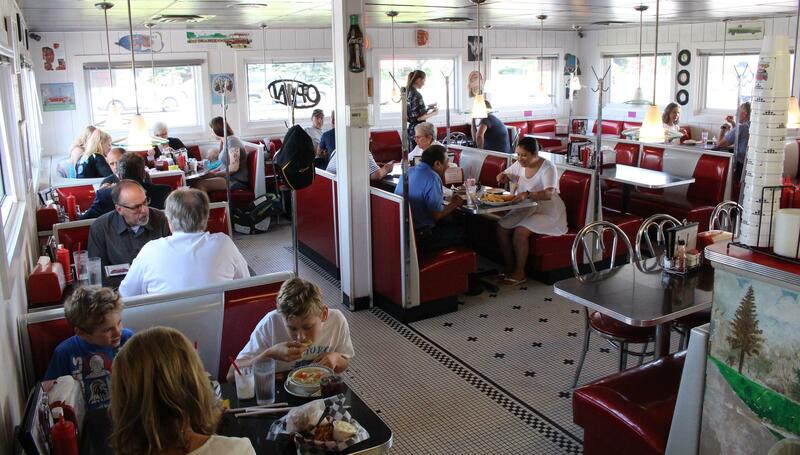 The interior of Don's Drive In has classic black and white checkered floors, red and white booths, a juke box and a pinball machine. Krystal normally brings the food out to drivers on trays that hook to the car window and stay put while they eat. But since Mary’s order is to-go, she doesn't get the tray. Mary says Don's is a blast from the past. She’s been coming here every couple of weeks on and off for the past 20 years. She says it reminds her of when she was young. "They were all like this when I was a kid," Mary says. "It just brings back good memories." As you pull into Mancelona, the highway narrows, following alongside railroad tracks and past a couple of abandoned warehouses. And then, there it is – a red, white and blue chicken, the unofficial mascot of the Iron Skillet.